How could the Bible command pilgrims to bring an Omer of barley to the Temple, if barley is one of the 5 forbidden grains on Pesach? Wheat, barley, oats, spelt and rye. Those are — as everyone knows — the five forbidden grains on Passover. How is it, then, that the Bible tells us that on the second day of Passover, pilgrims are to bring a sheaf (Omer) of barley to the priests of the Temple as an offering!? If barley is one of the forbidden grains, how can people be commanded to bring it to the priests?!?! This was an absolutely fabulous question that one of the participants in my Shabbes davenning group posed last week, during my lesson on the tradition of counting the Omer. And I confess, I was completely stumped! A few days of ruminating and a few hours of research later, I believe I have an answer. But please, weigh in, readers, if you have another angle on this vexing question! I think what we have here is a case of mixing civilizations — overlaying rabbinic ideas and definitions on earlier biblical ideas and definitions, which one really can’t do when wrestling with a question of a historical nature. And they shall eat the meat on that night, roasted over the fire, and matzos, with bitter herbs, shall they eat it. In the first month, in the evening of the fourteenth day of the month, you shall eat matzos, until the evening of the twenty-first day of the month. You shall eat no leavened bread with it; seven days you shall eat matzos, the bread of affliction; for in haste did you come forth out of the land of Egypt; that you may remember the day when you came forth out of the land of Egypt all the days of your life. Six days you shall matzos and on the seventh day shall be a solemn assembly to the LORD your God; you shall do no work therein. You will notice the conspicuous absence here of any mention of the five forbidden grains! Furthermore, the text leaves us with two key questions: What exactly IS “matzah” and what exactly QUALIFIES as “leavening”? We know how the rabbis answered those questions, but the rabbis — the authors of Mishnah and Talmud and basically all we know of Jewish law today –lived a good 700-1500 years AFTER the Torah was written down. The Pentateuch is generally dated to around 500 BCE. The Mishnah wasn’t redacted until 200 CE, and the two Talmuds came even later, in the 500 and 600s. It was the RABBIS who decided that there were five grains susceptible to leavening, and thus forbid them across the board. And it was the RABBIS who decided that 18 minutes was the magical number needed to keep the wheat in matzah from being “leavened”. For that matter, they were the ones who decided what matzah even was, and that it was even made out of wheat! Were the Israelites in the desert really eating flat, bland, wheat-made slabs that some rabbi hovered over with a spotwatch, and which could be easily confused with cardboard? Technically no one will ever know, but personally, I doubt it. All of this suggests to me that in the biblical times, barley was probably NOT a forbidden grain on Passover. If it were, the text wouldn’t tell us that they were commanded to bring it to the Temple on the passover . . .
וּסְפַרְתֶּם לָכֶם, מִמָּחֳרַת הַשַּׁבָּת, מִיּוֹם הֲבִיאֲכֶם, אֶת-עֹמֶר הַתְּנוּפָה: שֶׁבַע שַׁבָּתוֹת, תְּמִימֹת תִּהְיֶינָה. Do we know through biblical scholarship or some other avenue of insight that an Omer in this Levitical text is talking about barley in particular? If we do, I’d love to hear how we know. For, until we do establish that, then this text does not serve as evidence that barley was (or was not) being consumed during Passover in the biblical era. For me, this whole exercise was great fun, and it was also a good lesson and reminder: When in doubt, go back to the sources! 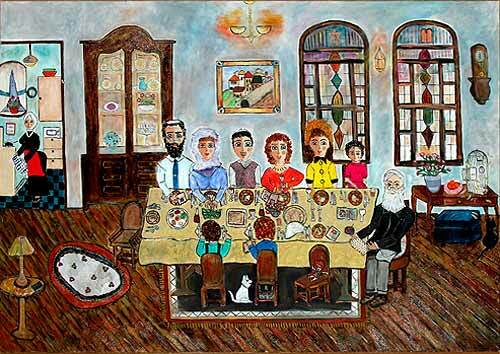 Artwork: This beautiful picture, titled “Pass the Matzah,” is available for purchase here.